Tom Interval understands that nothing is more important than your friends and family and that memories formed during personal gatherings are among the most special. His personal brand of magic, whether performed for adults or children, leaves a positive, lasting impression on your guests. Browse any of the sections below for more information. It's your special day, and you're looking for something truly unique and memorable to add to an already magical event. Tom Interval's walk-around magic is ideal for wedding receptions, especially while your guests are waiting for dinner to be served. Interval is an expert at blending in and mingling with the crowd as he performs highly visual, mind-blowing, interactive magic that people will talk about long after they see it. To schedule Interval to perform at your wedding reception, please contact him or visit the Bookings section of this site. Looking for something truly different to amuse guests at your next holiday party? 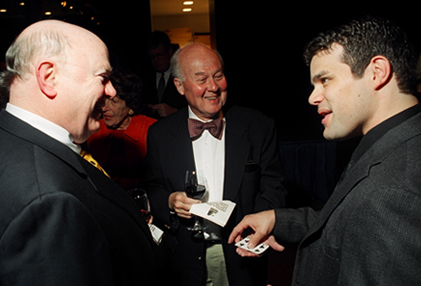 Well-performed magic is unquestionably one of the most unique, memorable forms of entertainment there is, and Tom Interval's magic can be tailored to fit the theme of any holiday. If you're interested in having Interval perform for a weekend party between October and December, be sure to book early because those months are generally among the busiest of the year. From birthday parties to anniversaries, Tom Interval understands how important your guests are. Whether it's family or friends you want to entertain, Interval's walk-around or stand-up magic adds a truly unique touch to any gathering. For adults, Interval performs sophisticated sleight of hand that is both amazing and entertaining, sure to please even the most discriminating magic lover. And for children, he performs a humorous stand-up act consisting of colorful, visually pleasing magic, letting young volunteers from the audience not only help with the magic, but actually successfully perform a trick in front of their friends. What's more, each child gets a free magic handout that teaches one to three easy-to-do magic tricks. To schedule Interval to perform at any of your personal gatherings, including formal dinner or cocktail parties, birthdays, anniversaries, reunions, bar or bat mitzvahs, and more, please contact him or visit the Bookings section of this site.